Take a thrilling ride along Barcelona’s coast on this 1-hour speedboat cruise. 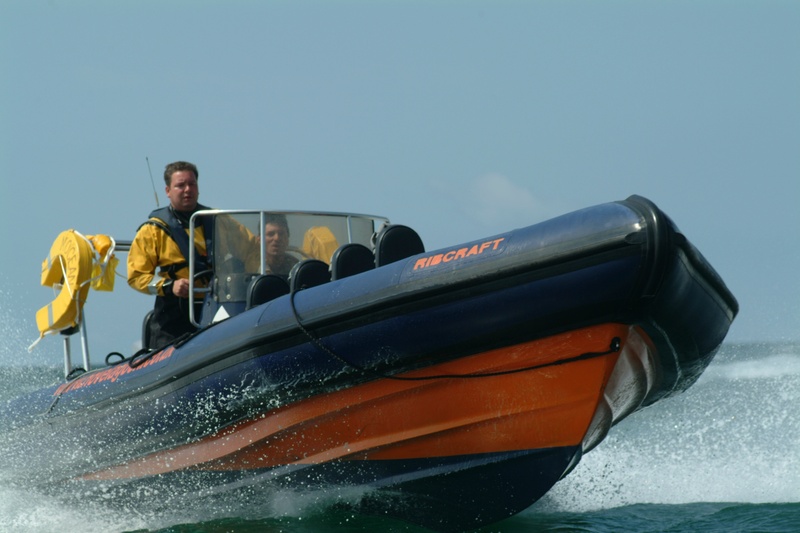 Board your state-of-the-art RIB (rigid-inflatable boat) with an expert driver, and take a high-speed cruise on the Mediterranean. Get washed by sea spray as your boat jumps the waves, performs tight turns and figures of eight, and puts on white-knuckle bursts of speed. Soak up great views over Barcelona and the mega-yachts at Port Vell Marina, and in summer, look for dolphins or tuna in the waters, and perhaps even take a swim from the boat. Meet your skipper at Port Vell Marina in Barcelona at your choice of the available departure times. Listen to a safety briefing and slip on a supplied lifejacket and any supplied wet weather gear you might need. Then, take a seat aboard your RIB: a custom-built, 26-foot (8 meter) craft powered by a 250 horsepower engine. With your skipper — a fully qualified powerboat driver — at the helm, feel the sea breeze whip through your hair as your state-of-art boat leaves its mooring. As you set off, ogle the glamorous super boats docked at the marina, including the Eclipse, the flashy mega-yacht of the Chelsea Football Club owner, Roman Abramovich. Hit the open sea and hold your clutch rail as your skipper pulls back the throttle and accelerates hard. Then, feel the adrenalin rush and sea spray as your boat performs super-fast turns, figures of eights and wave jumps, reaching speeds of up to 40 miles (64 km) per hour! In between the turns and moves, admire the views of Barcelona and pick out icons such as La Sagrada Familia and Montjuïc above the rooftops. You’ll also get views of the city’s beaches and, in high summer, perhaps even spot dolphins and juvenile tuna jumping in the waves. Summer weather permitting, you may also get the chance for a swim in the Mediterranean — bring a swimsuit and towel just in case. Complimentary beer, soda and water are also available during your cruise. After roughly an hour, and a last exhilarating burst of speed, cruise back past the extravagant yachts and moor at the marina, where your cruise ends.